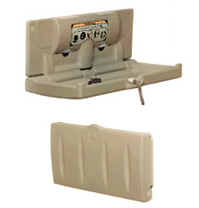 Wall Mounted Baby Changers,Koala KB200 and more Diaper Changing Stations, Stationary and Mobile Change Tables, Portable Baby Changers, Wall Mounted Baby Seat, Wall Mounted Diaper Dispenser, Diaper Dispensers and Diaper Disposal Systems, for Commercial Use in Hotels and Resorts, Daycares and more - Consumers can also purchase these Products. We offer a choice of vertical and horizontal wall mount diaper changing stations including the popular KOALA BEAR CARE models, Polyethylene and Stainless Steel with liner dispenser, Commercial Grade Wooden Change Tables with Storage, Portable and Permanent Table Top Baby Changers. Wall Mounted Baby Seats, Diaper Dispensers, Change Table Liners, Change pad Covers also available. NEW DIAPER KIT DISPENSERS AND DIAPER DISPOSAL BAGS TOO!! SM100V VERTICAL SURFACE MOUNT CHANGING STATION - Steel hinged design ensures years of service and the compact slim profile only protrudes 4.5" from the wall when closed. Holds up to 250 lbs when properly installed. EZ BACKER PLATE INCLUDED. Click here for Case of 500 liners. Available in light grey only. AVAILABLE IN CANADA ONLY. 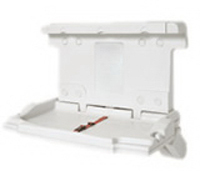 KB100 KOALA HORIZONTAL WALL MOUNTED CHANGING STATION - THIS UNIT HAS BEEN DISCONTINUED AND REPLACED BY KB200 BELOW. REPLACEMENT PARTS ARE STILL AVAILABLE. Click here for Case of 500 liners. Click here for Case of 500 liners. Unibody steel chassis supports 200 lbs with minimal deflection. Sleek design matches modern restroom design and d�cor. Bed surface exclusively contains Microban� antimicrobial, reducing odor causing bacteria. Dual liner cavity and two bag hooks. Projects 4� (101.6 mm) from wall when closed. SM100SSC STAINLESS STEEL CLAD HORIZONTAL RECESSED OR SURFACE MOUNTED CHANGING STATION - Sturdy Stainless Steel Encased Plastic Changer is rated to support 250 lbs. and can be recess or surface mounted. Click here for Case of 500 liners. NOT AVAILABLE IN THE US. Easy to Clean High-density Polyethylene body interior inhibits bacterial growth - meets ASTM G21 and G22. Easy to Read Instructions for installation. Pneumatic gas shock mechanism to ensure smooth, safe open and close motion. Sturdy Stainless Steel Changer is rated to support 400 lbs. and can be recess or surface mounted. Click here for Case of 500 liners. NOT AVAILABLE IN THE US. Horizontal Model - 23 1/8"H x 34 1/4"L. Tray extends 21" from back wall when open. Unit projects 4" from wall when surface mounted and closed. Vertical Model - 23 1/4"W X 3451/2"H. Tray extends 30 1/2" when open. Unit projects 4" from wall when surface mounted and closed. Mounting Hardware included. Surface Mount requires additional flange - Specify when ordering. 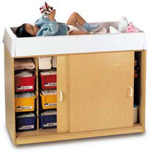 5114JC WOOD CHANGING TABLE - Change young children�s diapers and clothes with comfort and safety. Extra deep plastic rails exceed recommended safety standards and an included comfy changing pad make it easy to change young children�s diapers and clothes. One side with a fixed shelf, the other side with an open area for taller items. � keeping your space clean and organized. Meets ITERS and National Health and Safety Performance Standards. 48�" long x 23�" deep x 38" high. This stationary wood diaper changing station is constructed of eleven ply 5/8" Baltic Birch Plywood, heat-treated hardboard and/or pegboard and Northern Maple solid wood. Rounded corners and edging together with additional safety and strength construction features make these stations the ultimate in diaper changing facilities. Lifetime Warranty. Certified for indoor air quality. 118 lbs. 5131JC WOOD CHANGE TABLE WITH STAIRS LEFT - This stationary wood diaper changing station is constructed of eleven ply 5/8" Baltic Birch Plywood, heat-treated hardboard and/or pegboard and Northern Maple solid wood. Rounded corners and edging together with additional safety and strength construction features make these stations the ultimate in diaper changing facilities. Click here to see Matching Wall Mounted Diaper Organizer Available. Lifetime Warranty. Certified for indoor air quality. Pull out stairs for toddlers glides under table when not in use. Three shelves for storage of diapers and supplies. 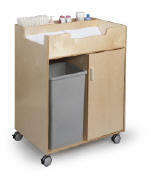 5130JC WOOD TUB CHANGE TABLE WITH STORAGE BINS - This stationary wood diaper changing station is constructed of eleven ply 5/8" Baltic Birch Plywood, heat-treated hardboard and/or pegboard and Northern Maple solid wood. Rounded corners and edging together with additional safety and strength construction features make these stations the ultimate in diaper changing facilities. Click here to see Matching Wall Mounted Diaper Organizer Available. Lifetime Warranty. Certified for indoor air quality. 5145JC DIAPER CHANGER WITH STAIRS AND PLASTIC TOP - LEFT OR RIGHT STAIRS - This stationary wood diaper changing station is constructed of eleven ply 5/8" Baltic Birch Plywood, heat-treated hardboard and/or pegboard and Northern Maple solid wood. Rounded corners and edging together with additional safety and strength construction features make these stations the ultimate in diaper changing facilities. Top is 6 1/2" deep plastic top that stands up to rigorous cleaning. Click here to see Matching Wall Mounted Diaper Organizer Available. Lifetime Warranty. Available in Rainbow Colored Accents with freckled gray laminate and six color choices for edgebanding. Certified for indoor air quality. Lockable glide out stairs with safety treads. Eleven clear cubbie trays included that can be secured behind doors. 5137JC CHANGING TABLE WITH STAIRS RIGHT - This stationary wood diaper changing station is constructed of eleven ply 5/8" Baltic Birch Plywood, heat-treated hardboard and/or pegboard and Northern Maple solid wood. Rounded corners and edging together with additional safety and strength construction features make these stations the ultimate in diaper changing facilities. 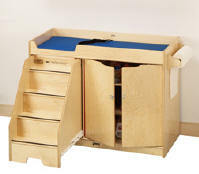 Pull-out stairs for toddlers conveniently glides under table when not in use. Extra deep rails exceed recommended safety standards. Three generous supply shelves, one fixed and two adjustable. Paper roll dispenser included accommodates a fifteen-inch paper roll and attaches to either end of the table. Changing pad and safety strap included. Click here to see Matching Wall Mounted Diaper Organizer Available. Lifetime Warranty. Certified for indoor air quality. 5141JC - DIAPER ORGANIZER - WALL MOUNTED (for all JC Coded Diaper Changing Tables) - Convenient wall mounted storage for diapering necessities. 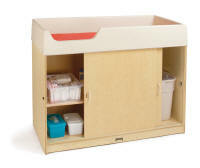 Install above changing table for a complete changing station. Mounting hardware included. Available in Rainbow Colored Accents with freckled gray laminate and six color choices for edgebanding. Certified for indoor air quality. Size: 48" wide x 12" deep x 25"
Constructed of eleven ply 5/8" Baltic Birch Plywood, heat-treated hardboard and/or pegboard and Northern Maple solid wood. Rounded corners and edging together with additional safety and strength construction features. Designed to match Serenity� cribs. Made of high quality Baltic birch. Features 7� deep changing area with safety strap. Available in Natural finish. Click here to view Matching Cribs. Matching Wall Mounted Diaper Organizer Available. Ready to assemble. NOT AVAILABLE IN THE US. Magnetic door locks require adult strength to open. Twelve cubbies provide ample storage. Includes 1� Professional Series� antimicrobial mattress pad. Contoured ends are styled to perfectly match Serenity� cribs. Arrives ready to assemble. Designed to match Serenity� Changing Table. Wall mounted unit Available in Natural finish. Click here to view Matching Cribs. NOT AVAILABLE IN THE US. Made of high quality Baltic birch. 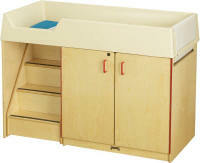 features three large and eight small cubbies for additional storage. CHANGING CABINETS - These Units come with safety strap and one roll of paper. Replacement Rolls and Mattresses available. Matching Wall Storage Also Available. 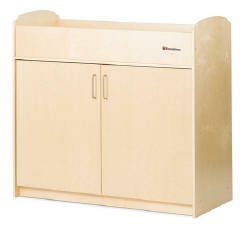 WB0648 - TODDLER CHANGING CABINET - No need to strain your back lifting those larger children onto the changing table. Behind Door #1 (on the left) our changing cabinet has an ingenious little stairway that slides out easily on tracks. 43"wide x 36" high x 25" deep. Mattresses available Safety strap and one roll of paper included. 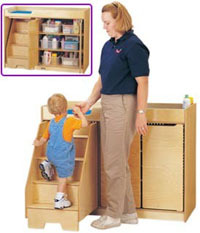 Versatile changing cabinet sized for infants. Ample space for a waste basket (basket and supplies not included). Easy access to diaper and cleaning supplies right next to the mattress area. Contoured mattress with strap included. Changing well cutouts at both the end and side of the unit to facilitate quick clean. No-pinch piano hinged door covers two fixed shelves and one on the floor. Ships fully assembled. Castors sold separately WB3004. Dimensions: 30in. � 15in. � 40in. Click here for Portable and Compact Crib Mattress Pads that can also be used for Portable Baby Changing. CF-322-146 - X-WIDE PORTABLE BABY CHANGER - For use on dressers, floor or other service - Gently sloping sides safely protect baby during change. Urethane form that meets California and European fire codes for flammability. Includes child protection straps. Grey Granite color. WB112 - CHANGING CABINET MATTRESS - For use with Changing Cabinets WB0688, WB0755, WB0648 AND WB0721 - All Pads 1" Thick - Specify Size. KB150-99 - KOALA SANITARY LINERS - Case of 500 biodegradable liners designed for Koala Changing Stations. Fits into dispenser on Changing Stations and in Liner Dispensers - Sold Separately. 18" X 13"
SM500- DIAPER SANITARY LINERS FOR WALL MOUNTED DIAPER CHANGE TABLES- Case of 500 liners designed for Wall Mounted Changing Stations. 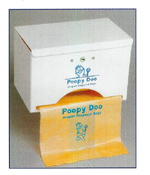 Fits into dispenser on Changing Stations and in Liner Dispensers - Sold Separately. WB110-455 - Change Table Paper - case of 12 Rolls. 14" Wide x 23' long. KB134-SSLD - KOALA STAINLESS STEEL SANITARY LINER DISPENSER - Recess Mount - Designed for dispensing Koala Sanitary Liners, this unit can hold up to 100 liners. 5 year warranty. 304 Brushed Stainless Steel. - Steel pivot rod in aluminum tube hinge mechanism. Textured seat surface with nylon safety straps that extend over child�s shoulders and between legs for security. Closed unit folds to less than 6� (143 mm), and requires less than 2 sq. ft (600 sq. cm) of wall space. Designed to support a child 50 pounds or less (22.7 kilograms). Seat surface exclusively contains Microban� antimicrobial, reducing odor causing bacteria. Constructed with 31% recycled materials; contributes to LEED certified building requirements. KB143 - KOALA STAINLESS STEEL WALL MOUNTED DIAPER DISPENSER - Designed to mount to the wall, this 18 gauge 304 stainless steel finished dispenser may be wall mounted or recessed with optional trim kit. Interlocking door with two tubular locks and multiple coinage settings. Koala Diaper Paks sold separately - see below - KB113. Dimensions: 5.25" D X 12.25" W X 42" H.
KB113 - KOALA DIAPER KIT - 120 Kits per case - includes one disposable diaper, one sanitary bed liner, two sanitary wipes, one disposable bag. For use with KB143 show above. Finally the perfect way to dispose of diapers in public restrooms, hotel rooms, daycares and more. These biodegradable and non-toxic bags are specially made, treated and sized for easy, convenient diaper disposal. Easy to tie, the bags do not leak and virtually eliminate the smell and leak from used diapers. Also available in Scooby Doo Version - Pet waste disposal system. White Powder Coated Metal - Scooby Doo is Green Powder Coated. Some of these Products are UPS Shippable - Contact us for delivery quotes.